Electrical Discharge Machining (EDM) makes it possible to machine configurations and work with metals for which traditional machining techniques are ineffective. EDM machining makes it possible to cut small odd-shaped angles, detailed contours or cavities in any electrically conductive metal including exotic metals like titanium, hastelloy, inconel, and carbide. The EDM Process is used in prototype and production parts manufacturing. 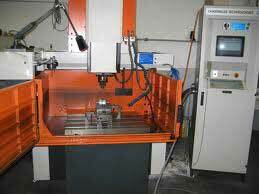 Primary as well as secondary machining operations are performed by EDM. 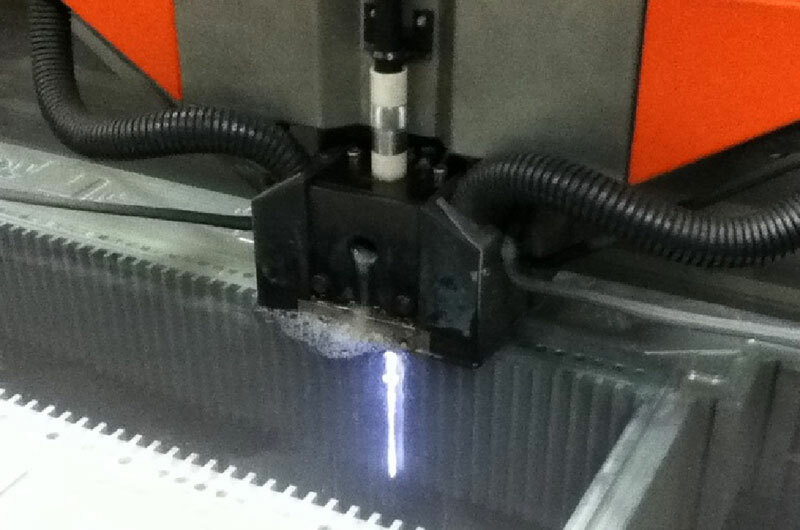 Wire EDM Machining utilizes a thin single-strand wire (usually brass) in conjunction with de-ionized water. The wire is electrically charged and removes material as it travels along a preprogrammed path. The de-ionized water insulates, maintaining the spark gap and flushes the eroded material away. 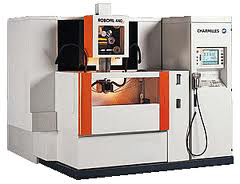 The wire EDM can easily machine complex parts and precision components out of conductive materials. Sinker EDM Machining is accomplished by submerging a shaped electrode and the metal work part in an insulating dielectric fluid. A current source is connected which is rapidly switched on and off automatically depending on the parameter settings made in the controller. When the current is on, an electric tension is created between the electrode and metal part. A spark gap is maintained when electrode and work part are brought together to within a fraction of an inch. The electrical tension is discharged and a tiny spark jumps across. Where it strikes, the metal is electrically eroded away. Several of our Wire EDM machines employ Clean Cut generator technology that improves surface finish while preventing oxidation on titanium and maintains surface integrity free of brass and zinc materials originating during the cutting process from the wire electrode. Bechdon has Wire and Sinker EDM machine capabilities as part of our complete manufacturing solution.